Posted by corterc in Bookmobile. 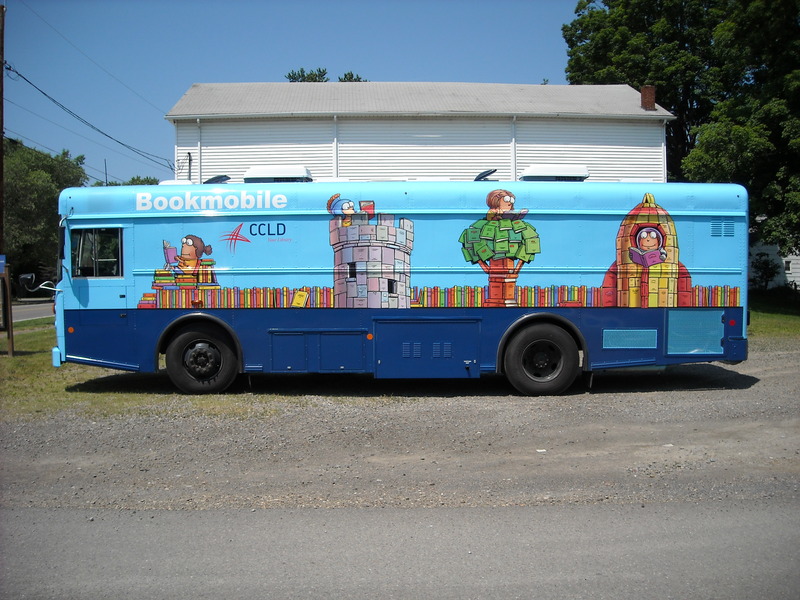 CCLD’s biggest marketing tool is its Mobile Branch, otherwise known as the Big Blue Bus or the Bookmobile. Its exterior is covered with colorful graphic drawings of happy children reading on a rocket ship, in a tower, a tree, a plane, and on the Chemung River. These smart illustrations were custom designed by nationally known, local children’s author, Tedd Arnold. Even if you’ve never used any of our County libraries, you can’t NOT notice this huge book filled vehicle traveling around the streets. It’s a reminder to everyone that our Chemung Libraries exist and are accessible at many locations. Currently, our Bookmobile maintains 47 different stops within a 2 week rotating schedule. Stops vary from neighborhood parks to elderly apartments to community centers and daycares and schools. The Mobile Branch team consists of driver Kim Jones, storytelling clerk Sue Schoeffler, and substitute driver Dave Swartwood. School classes are treated to stories during their visit and most are permitted to browse and check out a book to keep until the next time the Bookmobile returns. Elderly individuals look forward to the Bookmobile’s visit to keep them stocked up with their favorite author’s books. Besides, its regular stops, our Bookmobile participates in as many community events as possible. This year, the Bookmobile made a big presence riding in the Horseheads and Elmira Memorial Day parades and will be seen in the Elmira Downtown Holiday Parade. 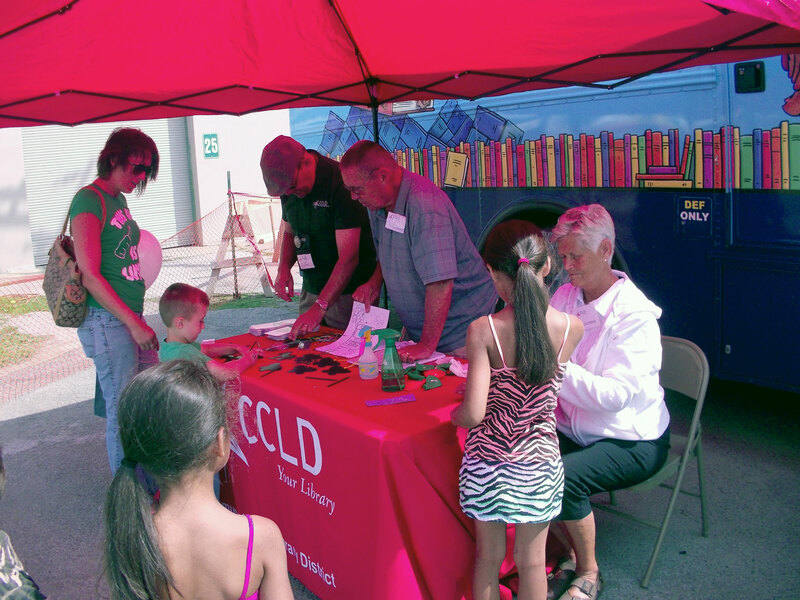 Those who attended the Family Reading Partnership’s Bookfest, Horseheads Family Days, Wellsburg Village Days, the Van Etten Festival or Strong Kids Safe Kids events may remember seeing the Bookmobile. Many times, the staff will set up an outdoor table, distribute information about the Library District, and provide activities for children. They have 2 very loyal and dedicated volunteers, Liz and Fred Southard, who have helped at most of these events. We are most appreciative of the time Liz and Fred give to the Bookmobile! The Bookmobile staff opens their doors to everyone to come, look around, apply for a library card and check out something to take home. The bus houses DVDs and audiobooks too. They can assist with inquiries about downloading eBooks or recent publications. If they don’t house an item, in most cases, they can borrow it from another library for you. We are very fortunate to have such a wonderful, visible, and accessible Mobile Library in Chemung County. If you’ve not been inside, take a look at the schedule on our website http://www.ccld.lib.ny.us/bookmobile.htm and visit the Bookmobile soon. I have been weeding the non-fiction collection, using a computer program that can generate a report of books that have not gone out recently. When we used to go to the shelves to weed the worn out, dirty out-of-date books, I enjoyed it. But now I keep finding books that I think would be so useful if someone just knew they were here! For example, one of the biographies on my weeding list is about a navy seaman’s experiences in WWII. 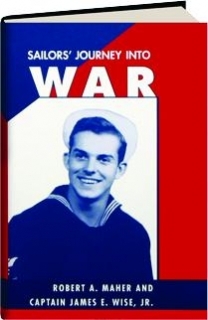 The Title is A Sailors’ Journey into War by Robert A. Maher. It looked like a brand new book and wasn’t very old, as the author was remembering his past. I brought it home to my husband who had been on a destroyer in the navy (not in WWII – we’re old but not THAT old) and he read and loved it. He brought it to our daughter’s neighbor who was also in the navy and said it was the best book he ever read; really described what it was like to be on a destroyer in a hurricane. Do I weed it from the collection because it is not being checked out? How do I get these books into the hands of people who would enjoy them? How do I get people to come to the library and browse among the stacks, to find just that book that speaks to them? Or get them to ask a librarian for suggestions as to what they would like to read about? It’s called Reader’s Advisory and one of the most fun parts of our job. I would have thought books such as Everything you need to know about birth control or Understanding Weight Loss Programs would be helpful to many people but they don’t go out. Do they get used in the library? I don’t know. If you have any ideas, let me know.